What a stunning and diverse walk! Don't be afraid of all the instructions - it was very easy to follow and actually quite fun. Highly recommended! A really beautiful walk for a fit climber! I would like to pint that the ‘fenced covered reservoir does not exist but there is a fenced house instead... otherwise the directions are excellent. I highly recommend for a sunny day. 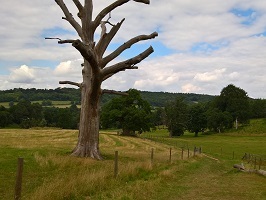 A 9.5km (6 mile) circular walk within the Surrey Hills which celebrates the Inspiring Views art project, visiting a number of beautiful viewpoints and discovering the sculptural benches and poetry inspired by these. You will be taken on a peaceful journey through the densely wooded rolling hills, interspersed with breath-taking viewpoints and artwork. Standing at the back of Car Park 5 (the Winterfold Donkins Car Park, which is accessed from Winterfold Heath Road. (NOTE: This road is incorrectly labled Greensand Lane on Google Maps), facing the beautiful view, turn left along the sandy path. Just a few metres along, you will see the first of the Inspiring Views sculptural benches on Winterfold Hill, just through the trees to your right. Fork right to reach this shelter and viewpoint and take time to pause and enjoy the surroundings. 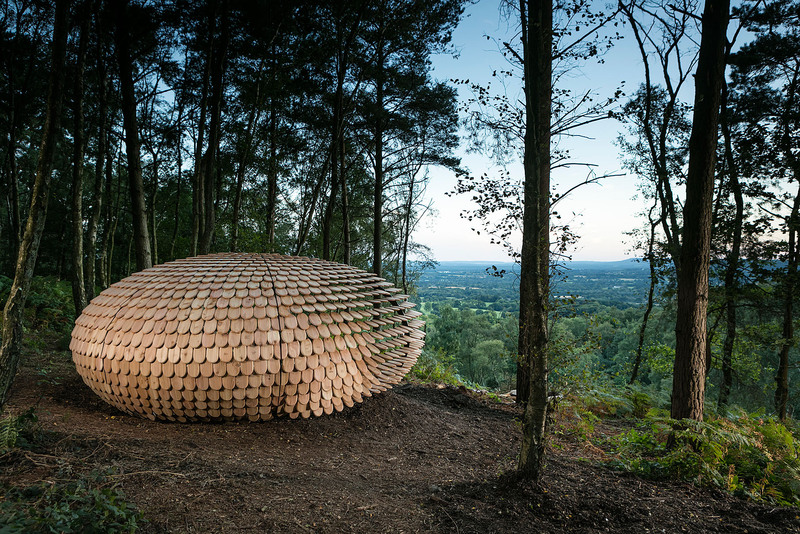 This shelter and bench is called Perspectives, created for the Inspiring Views project by sculptor Giles Miller. For this design, Giles explored how visitors of iconic sites and places of natural beauty often leave personal or commemorative messages for loved ones. He has designed a shelter from which to sit and look out on the beautiful view from Winterfold. The Giles Miller team has created a surface of wooden shingles engraved with words and messages from local people and visitors. Perspectives sits nestled within the woods with a clear view over the South Downs providing shelter and a space for focused contemplation.A poet and sound artist responded to this same view and you can listen to the poetry by tapping the Listen button below (App only). Visit inspiringviews.org to find out more about the art project, the location of the other benches. When you have finished at Perspectives, retrace your steps back to the main path and turn right to continue your journey along this. Follow this main path ahead, ignoring any small side turns. The path is part of the Greensand Way and is waymarked with yellow and black GW arrows.The Greensand Way is a long distance path of 108 miles which runs from Haslemere in Surrey to Hamstreet in Kent. 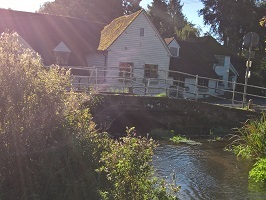 It was opened in 1980 and is jointly managed by Kent and Surrey County Councils. The trail follows the Greensand Ridge, a layer of lower greensand that was laid down in the Lower Cretaceous period, more than 100 million years ago. Over millennia of plate movements each of the historic layers here have been lifted up into a dome. Subsequently the softer clay layers were eroded away to leave the exposed harder sandstone ridges, such as this one. Eventually you will come to a triangular junction, bear left here (following the GW waymarker). Stay with this path which leads you straight over a tarmac access drive and then winds through the trees, leading you steadily downhill to reach the road. Turn right along the road edge (ignoring the sunken track bridleway on your right), continue past the informal parking area and, just as the road begins to rise, fork right (at just 1 o’clock) to join the path running parallel with the road (signed with the GW waymarker). This path climbs steadily and, further along, you will meet a small crossroads (with the road just a few paces to your left). Turn right for a few paces and then turn left (continuing to follow the GW waymarkers). Follow this path winding through the trees, later meeting a small T-junction. Turn right (signed GW) and keep ahead on this main path (ignoring any small side turns). 120 metres along (just after passing a large sweet chestnut tree on your right), fork right to reach the next bench and viewpoint, on Reynards Hill. 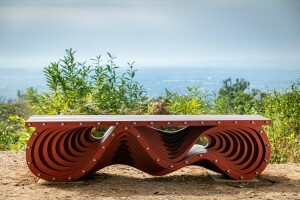 This bench is called Contour, created for the Inspiring Views project by sculptor Russell Jakubowski. For this design, Russell was inspired by the layers of marine sedimentation, contours of the land and the visible forms and cycles of nature on the Greensand Ridge. Russell carried out research into recycled plastic sheets as an environmental, robust alternative to wood. Sixty sheets of the wave like shapes have been bolted together to create the Contour bench, sitting at this breath-taking view point at Reynards Hill.A poet and sound artist responded to this same view and you can listen to the poetry by tapping the Listen button below (App only). Visit inspiringviews.org to find out more about the art project, the location of the other benches, the iFootpath walks that will lead you to them and listen to all the poetry and sound. When you have finished at Contour, return to the main path and turn right to continue along this. This next stretch of the Greensand Way is a compacted stone path, allowing easy access to the Reynards Hill view from the nearest car park. Pass alongside the vehicle barrier and walk down the slope into the car park (Hurtwood Car Park 4). Leave via the vehicle entrance (taking care of traffic) and turn right for a few paces along Winterfold Heath Road to reach the T-junction. Cross over and go straight ahead to join the signed footpath, still the Greensand Way. Follow this main path ahead (passing a cottage on your right and then crossing straight over a tarmac driveway). As you emerge from the trees, bear left to join a stone access track and just a short way along look up to your right where you will see Ewhurst Windmill. Just a few paces beyond the mill, you will come to a junction with a tarmac track. Turn right along this and, just before the entrance gate for Four Winds, fork left onto the narrow sunken path leading you downhill with a fence running on your right. NOTE: Take care as this stretch is fairly steep and rutted. At the bottom of the slope, pass through the gateway and continue on the short stretch of driveway to reach a junction with the road. To AVOID the climb to Pitch Hill, turn right along the road (taking care of traffic) and follow this passing The Windmill pub on your right. Now pick up the directions at the point marked within the next section. For the main route, cross over the road and walk ahead through the double metal gateway to enter the Pitch Hill parking area. Immediately after these entrance gates, turn right to join the public footpath (still the Greensand Way). Stay with this path which climbs gently and then more steeply, passing a bench (with a fenced quarry behind this) on your left. Continue on this main path ahead and it will lead you directly to the summit of Pitch Hill, with a trig point and donation box. Your path down from Pitch Hill is the narrow one on your right, in between the trig point and donation box cairn. But first, it is worth walking ahead across the open plateau to reach the simple bench on your right to take in the expansive views. When you are ready to continue, head back to the trig point and take the path (now on your left) after the trig point but before the donation cairn. Follow this path as it immediately bears right (probably soon crossing the branches of a fallen tree). Continue down this narrow path (taking extreme care as it is very steep and has loose scree in places). Towards the bottom, the path bears right to reach a sunken bike route. Turn left along this for a few paces to emerge out to a junction with the road (alongside a bridleway fingerpost). You will see The Windmill pub across to your right. Cross over the road and turn left along the road edge.NOTE: If you have skipped the climb to Pitch Hill, pick up the directions from this point. Join the raised right-hand pavement which leads you past Pitch Hill House. After passing a further handful of properties on your right, you will come to a fork in the road. Take the right-hand branch (signed as a public footpath and access for Stable House). Soon, just after passing a metal gate on your right, fork left onto the branch of driveway heading for a red brick property. Pass just to the right of this property on the narrow footpath and continue on this as it enters a tunnel of trees. Towards the bottom of the slope, the path bears right and then swings steadily left, around a circular wooden copse on your left (once the site of a Roman Villa). The path then leads you past the beautiful old buildings of Rapsley Cottage and Farm on your left. Just beyond the farm, ignore the footpath signed off to the right, instead continue ahead on the tarmac access drive. At the T-junction, turn right onto the tarmac drive heading for Wykehurst Farm. Continue as this becomes a stone track, passing a horse paddock on your right and then continuing into trees. At the end of this short stretch of trees, you will come to a choice of tracks and paths ahead. Take the second path on the left (at about 11 o’clock) passing through a wide metal gate. Follow this path with a tree line on your right and a fenced paddock on your left. At the bottom, pass a disused stile and walk ahead into the centre of the grass clearing (with a willow tree across to your right). You will see a small waymarker post up the slope (at about 11 o’clock). Walk towards this to reach a small crossroads. Go straight ahead (uphill) to join the grass path with fenced pastures and more great views across to your left. Continue ahead on this same grass path, later with trees to your left and horse paddocks behind a wire fence to your right. Beyond these paddocks you will see the wooded hills of the Greensand Ridge, from where you walked earlier. Stay alongside the tall fence on your right all the way to its end and then follow the path as it swings left into woodland. At the first small junction, bear left and then turn right to cross the stream via the wooden footbridge. At the far side of the bridge, turn immediately left on a path which leads you through a stretch of coppiced trees and then bears right, emerging out to the edge of a golf course. NOTE: This next stretch of path does not cross any fairways or ranges, but all the same keep your eyes peeled for any stray flying golf balls. Keep straight ahead, staying close to the line of trees on your left. Cross the stone parking area and walk straight ahead on the wide grass verge, with the fenced driving range to your right (and the clubhouse buildings down to your left). Pass to the left of the driving range building, then pass alongside a disused stile to reach a junction with the road, Barhatch Lane. Cross over the road and walk ahead into the entrance for Wyphurst Home Farm (signed as a bridleway). Pass a couple of properties on your right and then a pretty pond on your left to reach a junction marked with a fingerpost. Turn right here, continuing on the public bridleway. Walk straight ahead, passing through a wide wooden gateway ahead and continue on between the various old brick and wooden barns. Beyond the buildings, keep ahead on the stone and grass track, with a grass field to your right. You will come to a waymarker post, sitting underneath the wooden pylons. The main route back to the car park continues on the bridleway ahead, but first we take a short detour to visit the next Inspiring Views bench. Turn left and follow the grass track between fences and hedgerows. Follow the path down into some trees and cross the stile ahead to enter a grass meadow. Cross straight over and go through the kissing gate to enter a second meadow. Keep ahead, following the fence on your left, and cross the next stile ahead to join an enclosed grass track. You may be able to see the metal pyramid roof structure of Alderbrook House over to your right (more about that later…). Cross over the access drive and continue ahead on the fenced track between trees. As you emerge from the trees, you will reach the next Inspiring Views bench at the Alderbrook viewpoint. This bench was commissioned by the Alderbrook Estate and is called Xylem Voices, created for the Inspiring Views project by sculptor Walter Bailey. Walter had already created one sculpture, called Xylem, for Inspiring Views (located on Gibbet Hill). This bench further develops the theme and inspiration of Xylem, which explores the structure of charcoal. This time a sextet of xylem vessels, carved in oak, appear to call out across the landscape, perhaps with the sound of the water rising up the xylem vessels of an oak. Mature oaks can drink over 1,000 litres of water per day, this must be a seriously symphonic sound. When you have finished, retrace your steps back along the track and across the two meadows, passing through the kissing gate and crossing the two stiles along the way. When you get back to the waymarker post under the wooden pylons, turn left to join the bridleway leading you between tall hedgerows. Follow this bridleway through the tunnel of trees and ignore the first side track on the left. 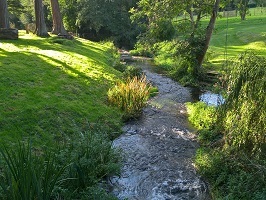 Keep ahead on the main woodland bridleway and, further along, the track crosses a stream. 300 metres further along, you will come to a junction with a side track on your right. Do NOT take this, instead keep ahead along the main stone track, passing the entrance for Colmans Farmhouse on your right. A few metres further ahead, you will come to a fork in the woodland bridleway. Keep left at this fork and follow this bridleway winding through the trees. Further along it follows a stretch of tall wire fencing on your left, the boundary for the grounds of Alderbrook Park.Alderbrook Park was created in the 1880s and comprises parkland, woodland and agricultural land, along with a range of estate houses and farm buildings. At its heart was a grand country house designed by eminent Victorian architect Norman Shaw. The original house was demolished in the mid-1950s. In 2013, a ground-breaking mansion was built here (with the two tall metal roof structures that you glanced earlier). These give the mansion the appearance of a pair of modern oast houses but are actually designed to cater for all the ecological and energy-saving measures incorporated into the building. Thanks to this redesign, the entire 340-acre estate is now carbon negative. As you enter a small clearing, follow the main track as it bears left, staying alongside the tall wire fence on your left. The track descends gently alongside this fence. At the bottom of the slope, keep ahead (uphill) for just a few paces and, where the track swings hard left, fork right to join the narrow woodland footpath (signed with a yellow arrow). The path leads you past a fenced covered reservoir on your left. Simply continue straight ahead passing two more waymarker posts. At the next subtle fork, take the left-hand branch (NOT the sunken path which soon turns right) and a few paces later you will approach the third waymarker post. Do NOT keep ahead here (despite the slightly misleading direction of the yellow arrow), instead fork left just before the post, onto a path leading you through the bracken and scrub (heading away from the main tree belt across to your right).NOTE: This path can become quite overgrown with bracken in the late summer, but is usually passable. If you miss this path (or find it too overgrown) then you could take the ‘straight-on’ branch for the climb. This winds more, but simply keep heading uphill and you will eventually reach the Greensand Way that you can follow (left) back to the car park. Back on the main footpath, along the climb you will pass a couple of reassuring waymarkers, confirming your route. If you have followed this path, it will lead you directly back to Car Park 5 on Winterfold Hill where the walk began. This walk features on walking website iFootpath, click on the iFootpath logo to find out more and download the app.